Photo: Governor James Ponder House, ca. 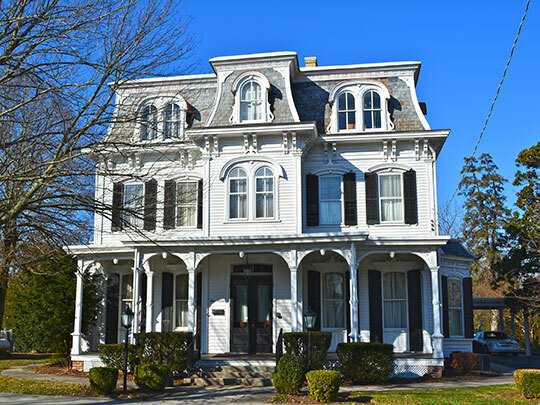 1875, 416 Federal Street, Milton, DE. Listed on the National Register of Historic Places in 1973. Photographed by User:Smallbones (own work), 2013, [cc-by-1.0 (creativecommons.org/publicdomain/zero/1.0/deed.en)], via Wikimedia Commons, accessed October, 2014. Sussex County Administrative Offices are located at 2 The Circle, Georgetown DE 19947. The County Seat was moved from Lewes to Georgetown in 1791. Geographically, Sussex County makes up 48.1 percent of the total land statewide – 938 square miles. More than half, 53.2 percent, of new residential construction in Delaware took place in Sussex County in calendar year 2005. The Republican Party has had majority control of the County Council only once in the body's 34-year history, for one election term, from 1986 to 1988. Sussex County ranks first among all United States counties in broiler chicken production, with 223 million birds grown in the 2002 census of agriculture, according to the United States Department of Agriculture. According to a study performed by the United States Census Bureau, retail sales, per capita, in Sussex County exceeded that for New Castle and Kent counties. The tax rate in Sussex County has remained consistent since the President George H.W. Bush administration. The Sussex County Finance Department was recognized for four consecutive years of outstanding accomplishments in reporting financial spending, most recently in July 2006. The County government was recognized by the Government Finance Officers Association of the United States and Canada with a "Certificate of Achievement for Excellence in Financial Reporting." Tourism is responsible for employing more than 10,540 people in Sussex County with an estimated economic impact of more than $709 Million, according to the 2005 report released by the Delaware Economic Development Office. There are 254 Agricultural Preservation Districts now in Sussex County. County government maintains 647 miles of underground sanitary sewer pipe and 256 pump stations. More people are moving to Sussex County than are being born here. According to population statistics, the majority of new residents in Sussex County in 2005 – 94 percent – were the result of "external migration," or people moving into the county from elsewhere. The balance was from natural increase (the difference between births and deaths). In Kent County, 80 percent of that county's population increase in 2005 was from external migration; in New Castle County, external migration made up just 28 percent of the total population increase there. According to the Delaware Office of Vital Statistics, an average of 8 babies will be born a week to Spanish-speaking parents in Sussex County for the foreseeable future. During calendar year 2005, paramedics responded to 14,796 calls or 1.68 calls per hour. Sussex County's unemployment rate in 2005 was 3.7 percent. This compares to 4.2 percent for the State of Delaware and 5.1 percent for the nation, also in 2005. Charles Cole, his wife Kitty, and son George are the only people since the 1974 election to have represented the Fourth Council District on the Sussex County Council. Sussex County is within an eight-hour drive of one-third of the population of the United States. Sussex County has long been noted as the birthplace for the commercial broiler industry; Mrs. Wilmer Steele of Ocean View started with 500 chickens in 1923. There are 18 public and private golf courses in Sussex County, including two Jack Nicklaus courses. The Town of Milton has 188 homes on the National Register of Historic Places. Cape Henlopen State Park in Lewes, where the Atlantic Ocean meets the Delaware Bay, is a 5,000-acre area with guarded beaches, nature trail, World War II observation tower, family campground and quarter-mile fishing pier onto the Delaware Bay. Delaware Seashore State Park, between Dewey Beach and Bethany Beach has six miles of ocean and bay shoreline for fishing, swimming and sunbathing. It boasts a 250- slip marina with head boats and a boat ramp. Seasonal hunting is permitted in some areas of the park. Holts Landing State Park originally a family farm sold to the state highway department in 1957, is a 203-acre area located on the southern shore of the Indian River Bay in Millville. Recreational facilities include tree-shaded picnic areas with grills and an adjacent playground, two ball fields and a boat-launching ramp for small motorized boats, sailboats and windsurfing boards. Fenwick Island State Park, situated between Bethany Beach to the north and Fenwick Island to the south, is Delaware's southernmost park. Little Assawoman Bay forms the western edge of this park, providing many opportunities for salt-water recreation. With 344 acres of ocean and bay shoreline for swimming, surfing and surf fishing, this park provides lifeguards during peak season and allows seasonal hunting in some areas of the park. Trap Pond State Park, four miles east of Laurel off Del. 24, offers hiking, fishing, swimming and camping activities as well as the simple enjoyment of a picnic amid abundant wildlife, wild flowers and bald cypress trees which grace these wetlands.